We haven’t been to every vegan spot yet but we’re so excited about the vegan scene in Denver because it seems to be getting better all the time. More vegan options at restaurants, more vegetarian restaurants that have vegan options and substitutes, and more totally vegan restaurants too! This guide contains both vegan restaurants but also some vegetarian and non-vegan restaurants that have great options to try. 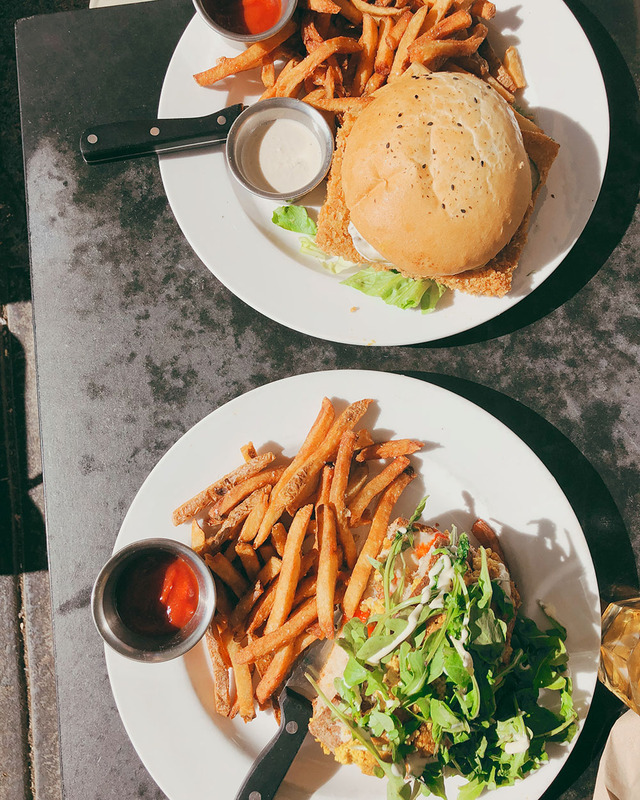 We like to think that ordering vegan options at restaurants sends a positive message to chefs and restaurant owners to keep making vegan options and also to add more. This place is amazing. They have a huge ALL DAY breakfast menu to go with their great lunch and dinner options. There can be a short wait during prime-time (dinner, weekend brunch…), but it’s totally worth it. They have great coffee (ask for the lavender latté) and serve baked goods from their vegan bakery, “Make, Believe”. They also serve alcohol, including beer, wine, cider, cocktails and mimosas. CUBAN SANDWICH – shaved smoky seitan with pepperoncinis, pickles, mustard, swiss cheese, and tofu bacon pressed into a hoagie. Beet Box is a small café right outside the heart of downtown with loads of delicious options. If you have a sweet tooth like me, they serve donuts, pastries, scones, cupcakes, and cakes. Savory options include made-in-house breads, savory quiches, a bangin’ breakfast sandwich and a variety of sandwiches for lunch. 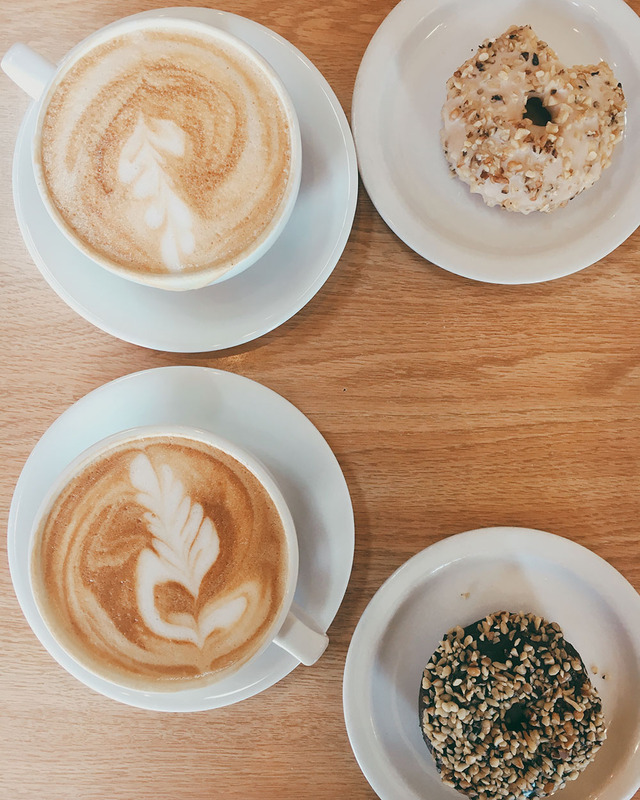 They also have great coffee and made-in-house creamy cashew milk. This is a fast-casual vegan chain restaurant with locations in 4 states (California, Colorado, Chicago and Oregon). They serve salads, sandwiches, wraps, soups and desserts. They have a variety of signature plant-based proteins like their tempeh, seitan, ‘Native Chicken,’ ‘Native Bacon,’ and cashew cheese. BISTRO STEAK SANDWICH – thinly sliced and seared seitan steak, topped with house made tofu bleu cheese, oven roasted tomatoes, crispy shallots and arugula on a toasted baguette. 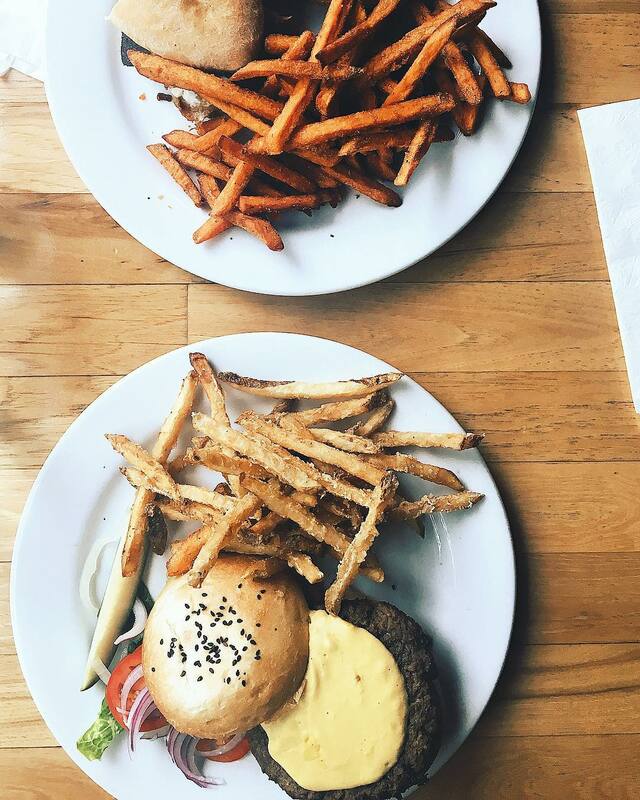 MetaBurger is the newest plant-based restaurant to hit the Denver vegan scene! 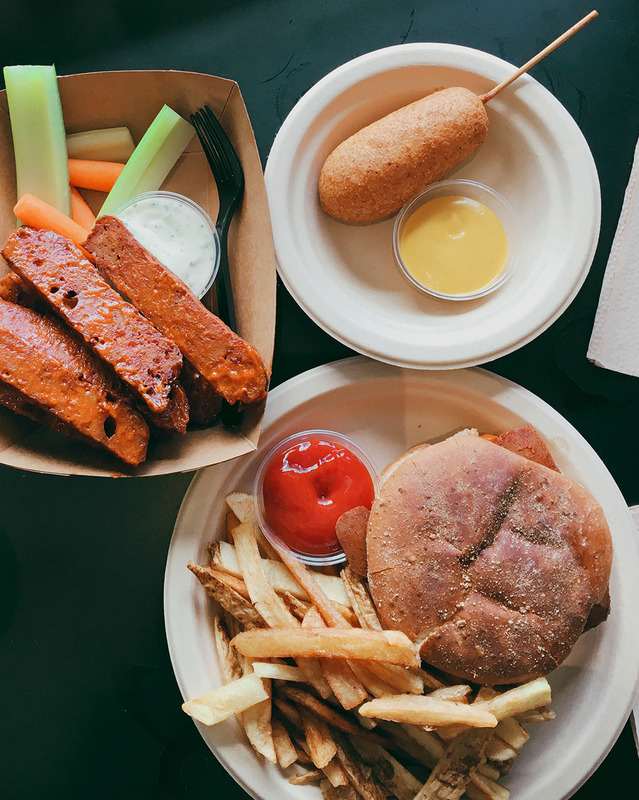 It’s located in a strip mall in south Denver and serves up delicious plant-based burgers with satisfying sides like meta bites, fries, and ice cream shakes! All vegan beers and a vegan food truck always parked out front! They have a small back patio where you can sit and enjoy a cold beer. They also host vegan pop-up dinners, movies, holidays, sports viewings, fundraisers, and an all vegan brunch EVERY Sunday with Wong Way Veg! Follow them on Instagram so you can keep track of which vegan food truck will be parked out front. FOR THE ANIMALS: THIN MINT – almond milk stout brewed with girl scout thin mints, almond milk, and cacao. Make, Believe bakery is a 100% vegan bakery that recently opened under the owners of WaterCourse Foods. They are a small bakery that specializes in allergy free baking. Their products are also available at Watercourse Foods and City O’ City (which is located right next door). Our Daily Bread Bakery & Deli is a new vegan, restaurant in Lakewood serving fresh breads, sandwiches, baked goods, salad bar, and daily soup. They grind their own wheat and use no preservatives. Their menu is limited but it’s 100% vegan. They use Violife cheese for their sandwiches (they sell the cheese too). Other items include a Seitan Steak Sandwich, a Chicken-Less Sandwich, and an Eggplant Melt Wrap. Nooch Vegan Market is a small vegan grocery and retail store where you can find all kinds of 100% vegan items. It’s so fun to shop at Nooch because you don’t have to think twice about reading the ingredient list on any of the items. They are also very helpful and friendly when you come in. Most items you might be able to find at other shops but they also have unique, specialty items that you can’t find anywhere else. They have a small selection of grab-and-go breakfast + lunch food too! Pro tip: don’t forget to bring your own reusable shopping bag. City O’ City is consistently packed and the wait can be long at prime times – which is understandable because they serve up some bangin’ eats. I believe everything can be made vegan when asked, and it’s all delicious. They have great breakfast and brunch to go with their lunch and dinner menus, and even serve late night from 11pm-2am EVERY DAY (even serving breakfast)! This is a must go place, so do not miss out if you have the chance. Opened in 2016, an awesome new vegetarian restaurant in the highlands neighborhood. Situated on Tennyson St., Vital Root is surrounded by trendy restaurants and local shops. Order at the register and sit down in the artsy dining room or outside on the herb-decorated patio. Vital Root is a fairly new restaurant, opening its doors in June 2016, but it does not disappoint with its creative and healthy dishes. They have plenty of raw options and 99% of their menu can be made vegan. Be sure to check it out if you want something new and fresh, as they have some of the best salads out there. also serving simple vegetarian & vegan fare. We have yet to try The Corner Beet but based on local reviews they have awesome juices, toasts, and salads. There have been a couple awesome food trucks popping up around town that are focused on vegetarian or vegan cuisine. They usually park outside of various breweries and coffee shops in Denver. You can sometimes also find them at vegan/veg fests, Civic Center Park, or outside Nooch Vegan Market. WongWayVeg is awesome! We are absolutely addicted to their Boulder Philly (see description below). The two women who run the truck, Lisa and Natalie, are so friendly, hardworking, and amazing. 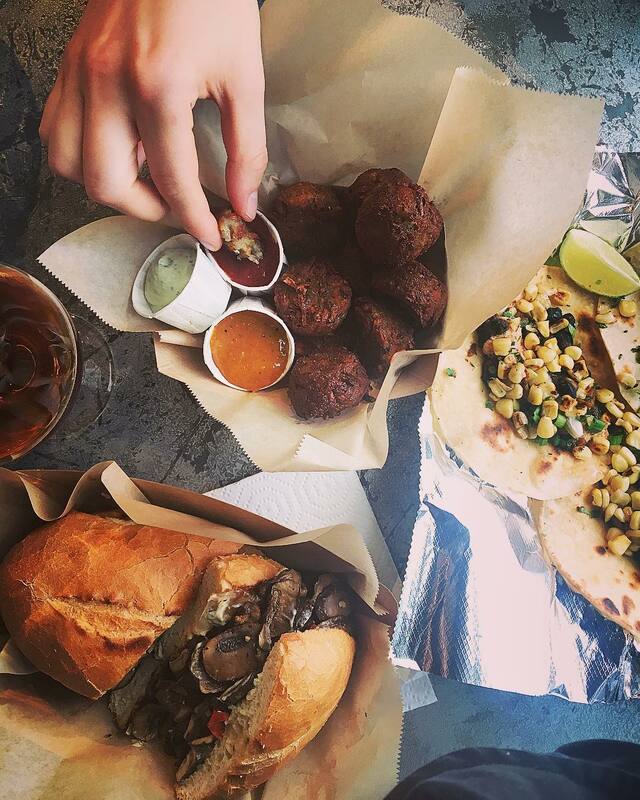 Not only does their menu continue to surprise and delight with plant-based deliciousness, they park outside of Alternation Brewing every Sunday and serve brunch! This is our FAVORITE food truck in town and one that you do not want to miss. BOULDER PHILLY – marinated portobello mushrooms, sautéed onions & peppers, roasted green chiles, and avocado-cashew cream (by request) on a toasted hoagie roll. BRAISED JACKFRUIT QUESADILLA – smokey braised jackfruit, roasted corn salad, choice of vegan cheese (by request) in a flour tortilla. The first time we found the Vegan Van, they were completely sold out of food because of a huge rush of hungry vegans! We finally got to try their food this year at VegFest and it did not disappoint! You can find them parked around town and sometimes they even show up outside Nooch for vegan brunch. 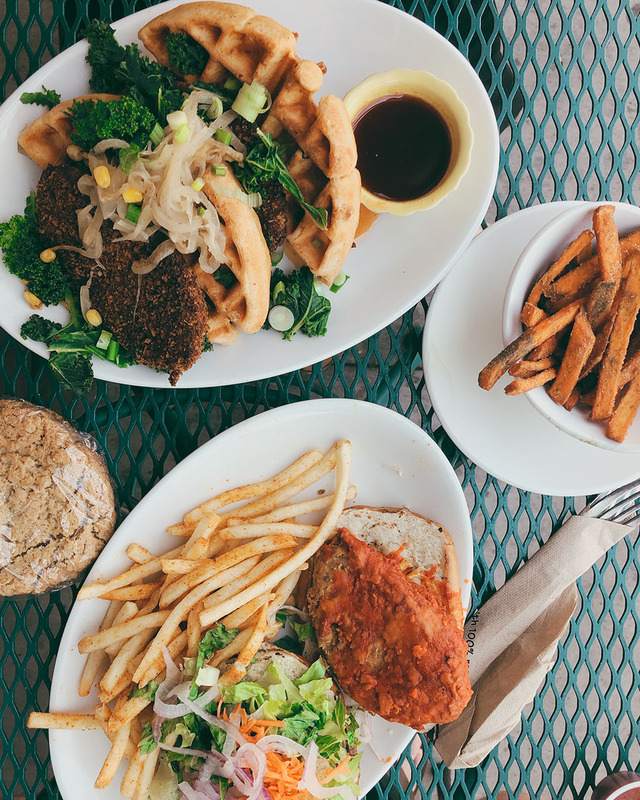 Serving up plant-based comfort food, you can find SOS Catering all over the metro-Denver area. The first time I had SOS was at Civic Center Eats and let me tell you, they did not disappoint! NEW! 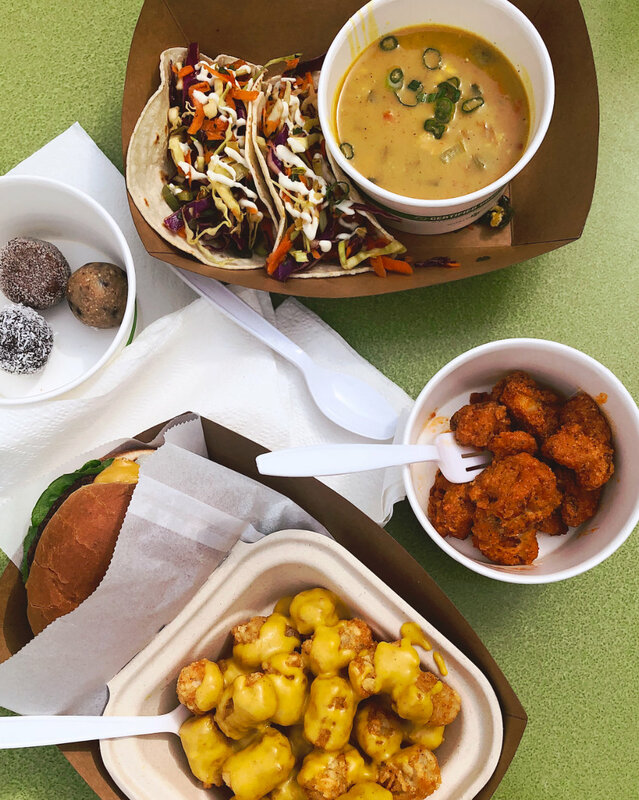 The Veggie Yeti Food Truck started providing service to the Denver area in March 2019. Run by Ben Como and Jared Simpson, this food truck is one you surely don’t want to miss! 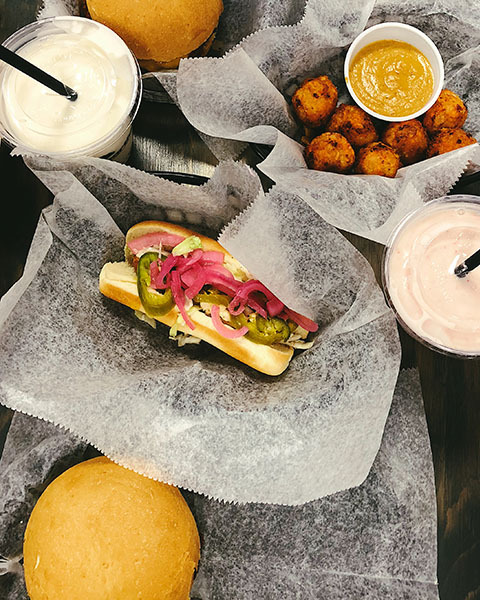 Serving up plant-based comfort food, you can find The Veggie Yeti’s schedule always updated on their instagram account. OLD FASHION CHEESEBURGER – the vegan cheeseburger of your dreams! Pro tip: get a side of cheesy tots and you’ll be in vegan food heaven. DESSERT BITES – yummy bite-sized raw balls in a few different flavors like cookie dough, snickerdoodle and brownie. NEW! Mu Denver is a brand new food truck that serves up “the BEST vegan ramen in Denver” according to the reviews on their facebook page. They are regularly parked outside of Nooch Vegan Market or Alternation Brewery. We will update this post with our favorites once we have the chance to try their food. We just find out about this vegan NiceCream truck but have yet to track it down. You can find their schedule here. Based on their Instagram photos, it looks delicious! We can’t wait to try Ba-Nom-a-Nom at VegFest this year. *Hours may vary, check website to be sure. Last updated April 2019. Hops & Pie – They offer pizza with housemade sausage, smoked tofu, and daiya cheese. Also, a “vegan sloppy jane” made with tempeh. Himchuli – they host a monthly vegan buffet night, every third Tuesday of the month! Alamo Drafthouse – Movie theater that serves food and drinks while you’re watching the movie. Their menu has a separate section for everything vegan!